I meet with you at the end of the works of your plenary session. I greet you cordially and I thank the Cardinal Prefect for his courteous words. We are in the Holy Year of Mercy. I hope that in this Jubilee all the members of the Church will renew their faith in Jesus Christ, who is the face of the Father’s mercy, the way that unites God and man. Therefore, mercy constitutes the architrave that supports the life of the Church: the first truth of the Church, in fact, is the love of Christ. How can we not desire, then, that the whole Christian people — pastors and faithful — rediscover and put at the center, during the Jubilee, the corporal and spiritual works of mercy? And, when in the evening of life, we are asked if we fed the hungry and gave drink to the thirsty, we will also be asked if we helped persons come out of doubt, if we were committed to receive sinners, admonishing and correcting them, if we were capable of combatting ignorance, especially that concerning the Christian faith and the good life. This attention to the works of mercy is important: they are not a devotion. It is the concreteness of how Christians must carry forward the spirit of mercy. Once in these years, I received an important Movement in Paul VI Hall; it was full. And I touched on the subject of the works of mercy. I paused and I asked the question: “Which one of you remembers well what are the spiritual and corporal works of mercy? Whoever remembers them, raise his hand.” There were no more than 20 in a Hall of 7,000. We must teach this to the faithful again, which is so important. There is a cognitive and unifying relation in faith and in charity with the mystery of Love, which is God Himself. And, although God remains a mystery in Himself, God’s effective mercy became in Jesus affective mercy, He having made Himself man for the salvation of men. The task entrusted to your dicastery finds here its ultimate foundation and it proper justification. The Christian faith, in fact, is not only knowledge to be kept in the memory, but truth to live in love. Therefore, together with the Doctrine of the Faith, it is necessary also to protect the integrity of customs, particularly in the most delicate realms of life. The adherence of faith to the person of Christ implies both an act of reason as well as a moral answer to His gift. In this regard, I thank you for all the commitment and responsibility you exercise in treating cases of abuse of minors by clergymen. Care for the integrity of the faith and of customs is a delicate task. A collegial commitment is important to carry out this mission well. Your congregation appreciates very much the contribution of consultors and commissioners, whom I would like to thank for their precious and humble work; and I encourage you to continue in your practice of treating questions in your weekly congress and those that are more important in the ordinary or plenary session. Correct synodality must be promoted at all levels of ecclesial life. 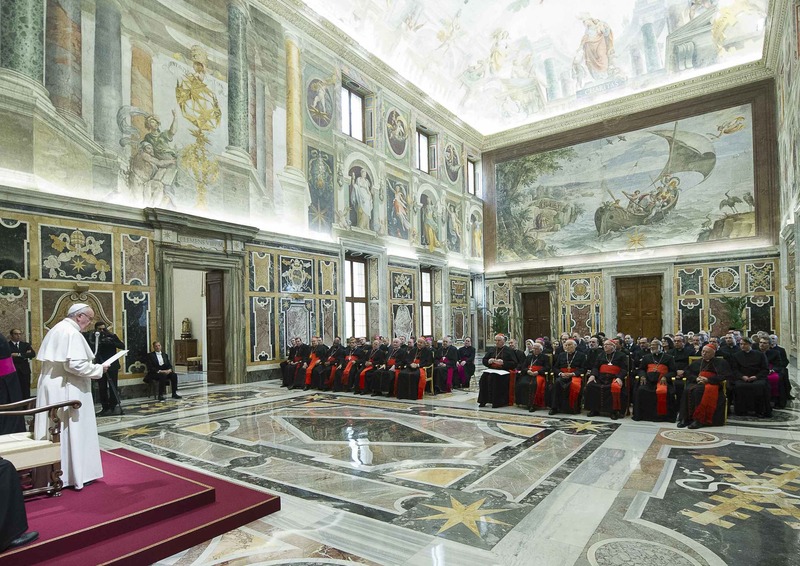 In this connection, last year you organized a timely meeting — with the representatives of the Doctrinal Commissions of the European Episcopal Conferences –, to address collegially some doctrinal and pastoral challenges. Thus, you contributed to awaken in the faithful a new missionary impetus and greater opening to the transcendent dimension of life, without which Europe risks losing that humanistic spirit that it loves and defends. I invite you to continue and to intensify the collaboration with such advisory organs, which help episcopal conferences and individual bishops in their solicitude for the holy Doctrine, at a time of rapid changes and growing complexity of the problems. Another important contribution of yours to the renewal of ecclesial life is the study on the complementarity between hierarchical and charismatic gifts. According to the logic of unity in legitimate difference — logic that characterizes every authentic form of communion in the People of God –, hierarchical and charismatic gifts are called to collaborate in synergy for the good of the Church and of the world. The testimony of this complementarity is all the more urgent today and it represents an eloquent expression of that ordered pluri-formity that connotes all ecclesial fabric, as reflection of the harmonious communion that it lives in the heart of God, One and Triune. The relation between hierarchical and charismatic gifts, in fact, refers back to its Trinitarian root, in the bond between the Divine Incarnate Logos and the Holy Spirit, who is always gift of the Father and of the Son. In fact, if this root is recognized and received with humility, it enables the Church to allow herself to be renewed at all times as “a people that derives its unity from the unity of the Father, of the Son and of the Holy Spirit,” according to the expression of Saint Cyprian (De Oratione Dominica, 23). Unity and pluri-formity are the seal of a Church that, moved by the Spirit, is able to set out with a sure and faithful step towards those ends that the Risen Lord indicates to her in the course of history. Here one sees well how the Synodal dynamic, if correctly understood, is born of communion and leads to an ever more realized, deepened and dilated communion at the service of the life and mission of the People of God. Dear brothers and sisters, I assure you of my remembrance in prayer and trust in yours for me. May the Lord bless you and Our Lady protect you.